We awoke to a bit of snow this morning. 10 cm or so. Not unusual in March, but it feels strange since easter is early this year. ohh! Climate change, obviously!! Crazy weather! 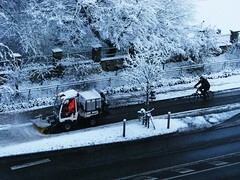 Winter cyclers have my respect and admiration! As they say, "if you don't like the weather in Denmark, wait a minute..."
you have to be ready for anything! Even with the snow the ladies opt for the hi-heals;) Great pics.